An OSHA rule issued Jan. 6 dramatically lowers workplace exposure to beryllium, a useful metal that can be hazardous to workers when particles are inhaled through dust or fumes during processing. The new standards, which apply to general industry, construction, and shipyards, will lower the eight-hour permissible exposure limit to beryllium from 2.0 to 0.2 micrograms per cubic meter of air. When concentrations exceed those limits, employers will be required to take additional measures to protect workers. The rule becomes effective on March 10, 2017, after which employers have one year to implement most provisions. For more information, see the beryllium final rule webpage. The Bureau of Labor Statistics reported that 4,836 workers were killed on the job in the United States in 2015, a slight increase from the 4,821 who died in 2014. At the same time, the rate of fatal workplace injuries dropped slightly, from 3.43 to 3.38 per 100,000 full-time equivalent workers, Transportation incidents were the leading cause of worker deaths, accounting for more than one-fourth of all fatal work injuries in 2015. Since OSHA began requiring employers to report severe injuries in 2015, the agency has recorded on average more than seven amputations a day. The total national number is undoubtedly higher because our data do not include workplaces covered by state plans. More than 90 percent of the reported amputations involved fingers; workers also lost hands, toes, feet and other body parts. These injuries are preventable by ensuring that machines are de-energized whenever they'e being serviced, and that machine guards or other engineering means are used to prevent contact with dangerous parts during operation. To learn more, read the blog. 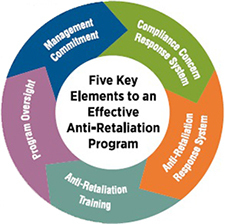 OSHA's Whistleblower Protection Programs has issued Recommended Practices for Anti-Retaliation Programs to help employers create workplaces in which workers feel comfortable voicing safety and other concerns without fear of retaliation. The recommendations, which are advisory only and create no new legal obligations, are intended to apply to all public and private sector employers covered by the 22 whistleblower protection laws that OSHA enforces. After more than seven years as Assistant Secretary of Labor for the Occupational Safety and Health Administration, Dr. David Michaels, who began his tenure in December 2009, left the agency on Jan. 10, 2017, to rejoin the faculty of the Milken Institute School of Public Health at George Washington University. Deputy Assistant Secretary Jordan Barab will serve as Acting Assistant Secretary until noon on Jan. 20, 2017. A 17-year-old worker clearing scrap underneath a laser-cutting machine was killed when the machine lowered, pinning him beneath. He had been on the job two weeks. OSHA's investigation found that employer, G.D. Roberts & Co. Inc., in Columbus, Wis., failed to ensure that machines were properly de-energized to prevent unintentional movement. 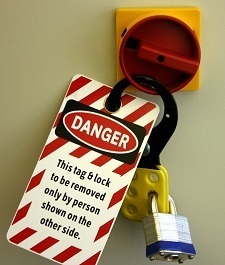 OSHA cited the company for 16 safety and health violations, including failure to train employees on proper lockout/tagout procedures, and proposed penalties of $119,725. Read the news release for more information. OSHA cited an oil well operator and two servicing companies following a flash fire that killed a worker and severely burned three others in Watford City, N.D. Operator XTO Energy and two servicing companies - Most Wanted Well Service LLC and Sherwood Enterprises Inc. - were cited for exposing workers to fire and explosion hazards and failing to provide flame-resistant clothing. Proposed penalties total $49,884. For more information, see the news release. A Wisconsin medical clinic sent maintenance workers into crawl spaces and other areas previously identified by the company as containing hazardous asbestos material, an OSHA investigation found. "Monroe Clinic knew its employees were working amid materials known to contain asbestos, and failed to inform them of the location of hazards and to protect them from exposure to a known carcinogen," said Ann Grevenkamp, OSHA's area director in Madison. The company was cited for 12 safety and health violations, including failing to provide protective clothing and respiratory protection. Proposed penalties total $261,890. Read the news release for more information. An employee cutting rubber material at a New Philadelphia, Ohio, plastics manufacturing facility suffered a severe injury when a pneumatic bench cutter severed her finger. OSHA inspectors found that her employer, Lauren Manufacturing, failed to adjust the machine's light curtains, which serve as safeguards to prevent a worker's hand from coming in contact with the machine's operating parts. In January 2015, OSHA cited Lauren for lack of machine safety procedures after a worker's arm was crushed in a hydraulic mold press. The company was cited for 13 violations of machine safety procedures including, allowing temporary workers to operate machines without proper training, failing to implement lockout/tagout procedures, and exposing workers to live electrical contacts. Lauren Manufacturing was proposed penalties of $274,934 and placed in OSHA's Severe Violator Enforcement Program. For more information, read the news release. During an inspection of Bosal Industries Georgia Inc., an automotive after-market parts manufacturer in Ypsilanti, the Michigan Occupational Safety and Health Administration found numerous violations that exposed workers to amputation hazards Inspectors for the state agency determined that Bosal failed to provide machine guards on potentially hazardous machinery and failed to protect workers from an open manhole, among other violations. The company was cited for 19 violations and issued $265,000 in penalties. For more information, see the news release. A Minnesota construction company was cited for failing to train and protect its employees following the collapse of an unprotected trench that trapped two workers, killing one of them. The Minnesota Occupational Safety and Health Administration, a state agency, cited Dave Perkins Contracting Inc. of Anoka for three serious violations and issued $50,825 in penalties. A pipefitter previously employed by manufacturer John Deere will receive $204,315 in lost earnings and $70,685 in other damages in a settlement that resolves a U.S. District Court lawsuit filed under the anti-retaliation provision of the Occupational Safety and Health Act. The pipefitter was terminated from Deere's Moline, Ill., facility after reporting unsafe working conditions and filing a complaint with OSHA. The company will also prominently post information about worker rights in all workplaces. For more information, read the news release. An OSHA investigation found that BNSF Railway violated the Federal Railroad Safety Act when it terminated a track inspector for insubordination after the worker reported railroad track defects to management. OSHA ordered BNSF to pay more than $147,000 in back wages and damages and take other corrective actions. OSHA enforces the whistleblower provisions of the FRSA and 21 other statutes protecting employees who report violations in various industries. For more information, see the news release. Secretary of Labor Thomas E. Perez has appointed nine members to the Whistleblower Protection Advisory Committee. Members will serve through Nov. 30, 2018. WPAC advises and makes recommendations to the labor secretary and the assistant secretary for occupational safety and health on ways to improve the fairness, efficiency, effectiveness and transparency of OSHA's whistleblower protection activities. The complete list of WPAC members is available online. A growing number of employers are incorporating the concept of sustainability in their business strategies. This approach factors financial, social and environmental concerns as part of a business' bottom line. OSHA recently launched several resources—including a white paper, blog, and organizational profiles—to demonstrate why protecting worker safety and health should also be part of any sustainability effort. The white paper highlights ways sustainability can include innovative approaches for advancing safety and health. 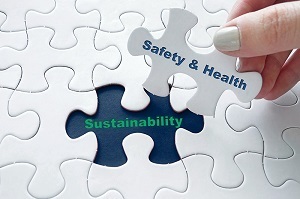 To learn more, read the news release and visit OSHA's sustainability webpage. To share your questions, suggestions and successes, contact sustainability@dol.gov. A recent article by two OSHA physicians, published in the Journal of Safety Research, describes the agency's efforts to improve employer recordkeeping. It also examines under-recording, which leads to inaccurately low counts of worker injuries. Under OSHA's recordkeeping and reporting requirements most employers with more than 10 employees must keep a record of serious work-related injuries and illnesses. Minor injuries requiring first aid only do not need to be recorded. The article identifies that poorly operated on-site nursing or first aid stations are a rarely recognized cause of under-recording. 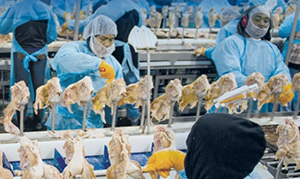 As an example, in some poultry plants, OSHA found that these stations were staffed by emergency medical technicians and licensed practical nurses with little to no nursing or medical supervision, who functioned without appropriate protocols and provided care beyond their scopes of practice. In some cases, workers were seen multiple times without referral for a definitive evaluation, diagnosis and treatment. By restricting treatment to first aid and preventing access to higher level medical care, these cases were kept off employer recordkeeping logs. OSHA has issued a final rule that clarifies an employer's continuing obligation to make and maintain an accurate record of each recordable injury and illness. Effective Jan. 18, the new final rule more clearly states employers' obligations. "This rule simply returns us to the standard practice of the last 40 years," said OSHA Assistant Secretary Dr. David Michaels. "It is important to keep in mind that accurate records are not just paperwork; they have a valuable and potentially life-saving purpose." For more information, see the news release. OSHA's Denver and Englewood, Colo., area offices and the Colorado Safety Association are renewing their 2012 alliance to reduce and prevent safety hazards in Colorado. 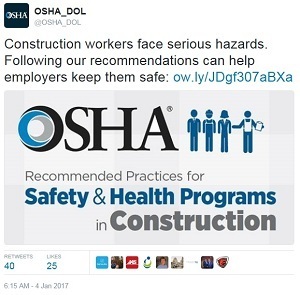 Representatives of OSHA and CSA will continue to work together over the next four years to provide the association's members and others with information and training resources that will help prevent workplace injuries, and improve understanding of workers' rights and the responsibilities of employers under the Occupational Safety and Health Act. For more information, see the news release. Utah-based Western Metals Recycling LLC implemented improvements to its safety and health program at its facilities in Salt Lake City, Provo, and Plymouth following a free OSHA on-site consultation that identified electrical, housekeeping, and machine guarding hazards. The company initiated an "Eye-On-Safety" program as a way to quickly change and maintain a new culture that would put workplace safety and health first. Other programs included the Traffic Control Plan, Employee 4-Hour Safety School, and New Employee Safety Mentor Program. The company also created comprehensive written safety policies that call for frequent inspections by supervisors and safety managers. All three sites participate in OSHA's Safety and Health Achievement Recognition Program, which recognizes small business employers who operate an exemplary safety and health program. For more information, see Western Metals Recycling's success story. Responding to natural and man-made disasters puts emergency response workers at risk of injury or death from slips, trips and falls. A new OSHA QuickCard explains what employers must do to keep workers safe. This includes: assessing the worksite for hazards; providing protective equipment such as head protection, gloves, and slip-resistant footwear; and training workers to identify hazards.